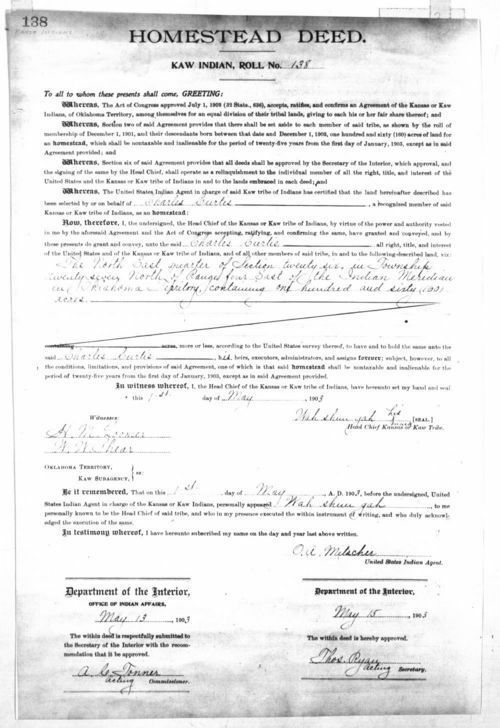 A homestead deed for Charles Curtis, a member of the Kaw tribe of Indians, signed by Wah-shun-gah, head chief of Kansas or Kaw tribe. Photostat copy made from original lent by Doctor Berlin B. Chapman, Oklahoma, A. & M., August 1946. Curtis served in the U.S. Senate for Kansas from March 4, 1907 - March 3, 1913 and was vice-president to Herbert Hoover from March 4, 1929 - March 3, 1933.